The seven years that are left on the prophetic clock, as spoken of in Daniel chapter nine, have been called the 7 years of tribulation by many. This terminology truly means different things to different people. To this author, it is truly 7 years set aside by the Lord and not really 7 years of tribulation alone, but 3½ years of great tribulation followed by 3½ years of God's wrath with the rapture being in the middle. 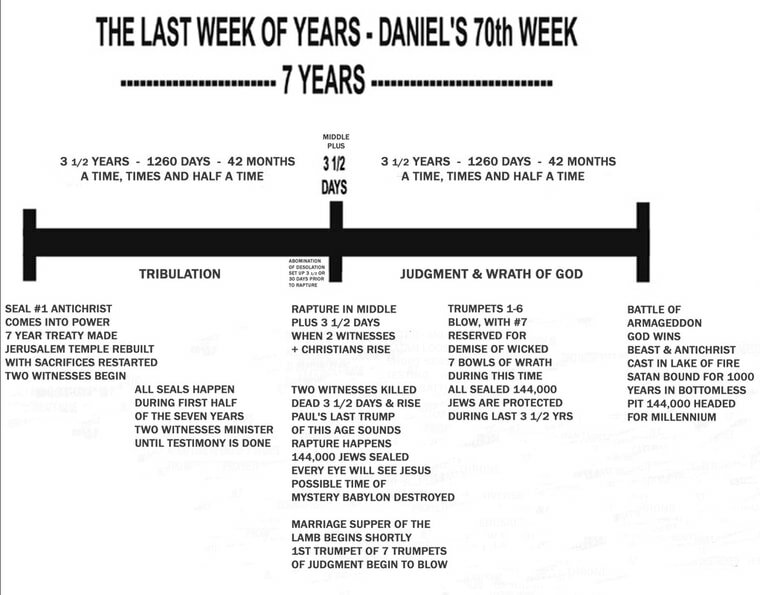 But for most pre tribulationists, they call it the 7 years of tribulation and then say that the rapture has to be at the very beginning because “God does not pour out His wrath on His children” so that what they are really saying is that the last week of years or what is commonly called the “7 years of tribulation” is really 7 years of God's wrath. Which is not true, in that it is not seven years of God's wrath! For anyone to say that this “last week of years” is “completely a time of God's wrath” is completely erroneous. It is beyond the shadow of doubt that: these seven years are divided into two vastly different segments with the first half having Christians present and living through great tribulation just as Jesus foretold, with the rapture in the middle followed by the second half when God's wrath will be poured out just as John foretold of in the book of Revelation. This will be clearly shown in this message. For the sealed 144,000 Jews, one could certainly call it a time of great tribulation for them also. But God's wrath is specifically for the wicked who are left after the rapture and the term of His wrath is one half of this last week of years which is 3½ years! Seven years minus the terms of Antichrist and Two Witnesses, which are both for 42 months (also called a time, times and half a time,1260 days or 3½ years), leaves 3½ years left for 7 trumpets, 7 bowls & Armageddon. 1. There is a last week of years, the last 7 years of this age. From Daniel 9 we know Father God has the last seven years set aside (which is the topic in the next message). 1 Thessalonians 1:9-10 “For they themselves declare concerning us what manner of entry we had to you, and how you turned to God from idols to serve the living and true God, and to wait for His Son from heaven, whom He raised from the dead, even Jesus who delivers us from the wrath to come." 1 Thessalonians 5:9-10 “For God did not appoint us to wrath, but to obtain salvation through our Lord Jesus Christ, who died for us, that whether we wake or sleep, we should live together with Him." What else do we know for certain about this last seven years, according to God's Word? Do we know how long he will go against the saints? All 7 seals are for the first half of the 7 years concluding at the rapture at the middle or middle plus 3 ½ days. The first seal is the beginning of the rise of the Antichrist when he is given his authority (Revelation 6:1-2), followed by 6 more. The last 2 seals are the rapture. So by this we can be sure that the seven seals are for the first 3½ years ending with the 7th being the rapture (Revelation 8:1). The 7 trumpets and 7 bowls happen after the rapture, when God's wrath is poured out. While we do not have all the answers, the basics are clear as you can see by the chart below. Even if one were to still consider this last week of years, all tribulation, it would be closer to being correct than to say it is 7 years of wrath. The Lord's wrath is for the wicked only and it will only come upon them, after His children are raptured up and the 144,000 Jews are sealed. Eventually, at the conclusion of the Battle of Armageddon, all of the evil people who are still alive, will be eradicated (Revelation 14:17-20, 19:21). We all need to be right with God and see as many people be right with God also. All that has been prophesied by the Lord, what we understand and we do not, will still happen. Final thoughts that obliterate pre tribulationism: If the Holy Spirit would be removed at the beginning of the 7 years and the rapture happen because God's wrath is not for His children; and if as they say that people would still be getting saved after the rapture, then how do they justify the newly saved children of the Lord going through God's wrath since the Bible really does say that God's wrath is not for His children and how could anyone be saved without the conviction and leadership of the Holy Spirit? If you would like to see a "word study" on the biblical definitions of "tribulation and wrath," click here: WORD STUDY.